The world has nudged a bit further from a nuclear apocalypse and environmental disaster, a trans-Atlantic group of prominent scientists declared Thursday, moving the hand of its symbolic Doomsday Clock one minute away from midnight. It is now 6 minutes to midnight, according to the Bulletin of the Atomic Scientists, which made the decision in consultation with its board, which includes 19 Nobel Laureates. Citing "a hopeful state of world affairs," the group said that for the first time since World War II, leaders are cooperating in efforts to curb nuclear bomb-making. The group added that "for the first time ever, industrialized and developing countries alike are pledging to limit climate-changing gas emissions that could render our planet nearly uninhabitable." "These unprecedented steps are signs of a growing political will to tackle the two gravest threats to civilization - the terror of nuclear weapons and runaway climate change," the BAS said in a statement. The group credited the U.S., particularly President Barack Obama, for a newfound sense of international cooperation and engagement on the issue of nuclear weapons. "With a more pragmatic, problem-solving approach, not only has Obama initiated new arms reduction talks with Russia, he has started negotiations with Iran to close its nuclear enrichment program, and directed the U.S. government to lead a global effort to secure loose fissile material in four years," BAS said. Created in 1947, the Doomsday Clock has been adjusted only 18 times, most recently in January 2007 and February 2002 after 9/11, according to the group. 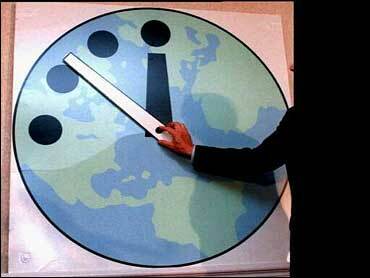 The clock has been as late as two minutes to midnight -- in 1953 -- and as early as 17 minutes to midnight, in 1991. The group warned that the incremental shift of one minute means much more work needs to be done to avert a catastrophe. "There's great potential for it to move in either direction," said Lawrence Krauss, the co-chairman of the board.